Cats are, by their very nature, companion animals. That means each and every cat deserves a human companion to love and care for him or her. It stinks when a cat is born outside and no human cares about him or her. It's even worse when a human decides to be mean to them. Heather and Haley were born outside. Their mom was reportedly killed by a car. The homeowner threatened to do harm to these innocent kittens unless they were "removed." And so now these unsocialized youngsters are under the care of the Medfield Animal Shelter and it is our duty to ensure they will have a happy future. We estimate they are about 5 months old. They are extremely frightened. 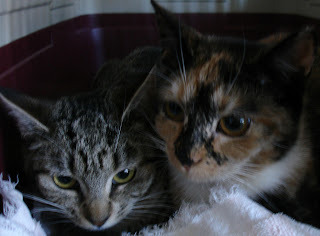 They are thankfully in an excellent foster home where family members will interact with them as much as possible in order to determine if they will want to be indoor family pets or if they will fear humans forever preferring to live outdoors away from humans or perhaps to work as a barn cat. Haley and Heather are young and deserve a chance. We are extremely thankful to all our friends who help cats in need and also to our foster families who give these deserving animals a chance.